Inaugural Female Hockey Day showcases "Why We Play"
RED DEER - Hockey Alberta’s inaugural Female Hockey Day was an overwhelming success, with hundreds showing up to take part in the day-long celebration. Over 160 athletes took part in activities throughout the day, which included on-ice sessions for players and officials of all levels, and off-ice sessions, such as dryland training, parent education sessions, and sport ambassador sessions. In addition to players from Red Deer College, young athletes also had the chance to hear from a handful of players from the Calgary Inferno, who were in town to play the Toronto Furies in the first-ever Canadian Women’s Hockey League game to be played in Red Deer. The game served as the exclamation point for Female Hockey Day, and drew a crowd of over 600 fans to the Gary W. Harris Canada Games Centre. Valerie Gill, the captain of the gold medal-winning Team Alberta U18 Female squad at the 1991 Canada winter games, carried out the ceremonial puck drop before the game. One lucky athlete, Rozene Sabeti-Seidel, took to the ice with the Inferno during the pre-game skate, and stood with the team during the National Anthem - an honour she earned as the winner of the ’Experience the Dream’ contest. 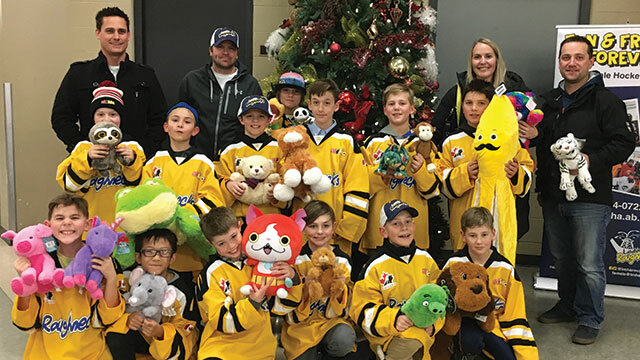 Through a "chuck-a-puck" contest and a silent auction, the Hockey Alberta Foundation also raised over $1,000 for the Every Kid Every Community program during the game. RED DEER - Hockey Alberta is pleased to present the third installment of the Western Hockey League’s officiating partnership video series. *Note - Staff will be on hand to answer phone inquiries on December 27, 28 and 31, and will be monitoring email messages submitted at info@hockeyalberta.ca. Please note that every effort will be made to respond to your inquiry as soon as possible; however, due to the holiday season, longer than normal delays in responding could be possible. 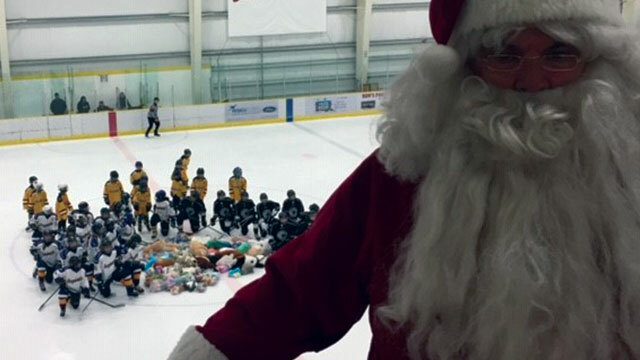 Alberta’s hockey community is always at its best during the holiday season, and we’ve asked Minor Hockey Associations and teams from across Alberta to share their stories of giving back to the community with us. If you would like to share your team’s story of giving back during the holidays, please email info@hockeyalberta.ca with details and photos. 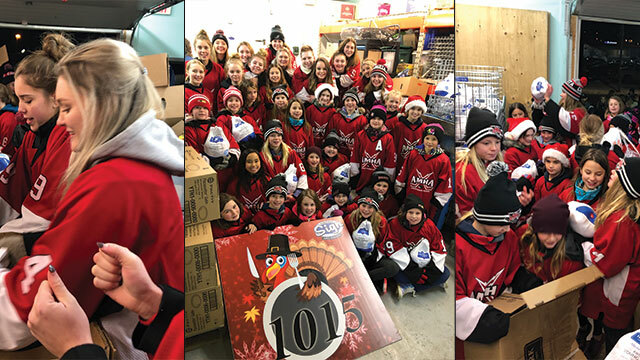 The Airdrie Midget Elite Lightning of the Alberta Female Hockey League, along with the Airdrie Female Atom teams collected donations to purchase 1,015 turkeys to donate to the Airdrie Food Bank. 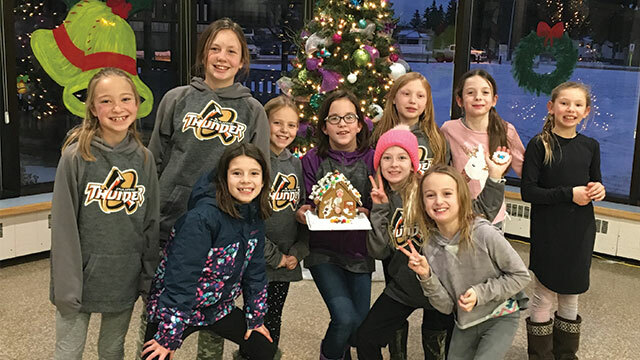 The Brooks Prairie Thunder Atom Female team volunteered their time at a long-term care nursing home, decorating crafts and ginerbread houses with the residents, helping get them into the holiday spirit. "Duchess Minor Hockey hosted "Hockey Day in Duchess" where all of our league teams played in a single day." "We had a lot of fun things going on, such as a "fill the net" food bank and toy drive, a teddy bear toss, Santa selling 50/50, Christmas themed raffle items, donated baking for sale and a pancake breakfast." "All of the proceeds from the pancakes, baking and raffle table were being given to the Canadian Tire Jumpstart program, and all the teams donated their half of the 50/50 money back for this charity as well." "It was a fantastic weekend in the spirit of the holidays, and we ended up giving 309 lbs of food to the food bank, 4 bags of teddy bears and 4 boxes of toys to the Soctiabank Smiles for Christmas program and an amazing $1600 towards the Jumpstart Program! I also found out that our local Brooks Canadian Tire is going to top up that donation by adding another $500 towards the program!" 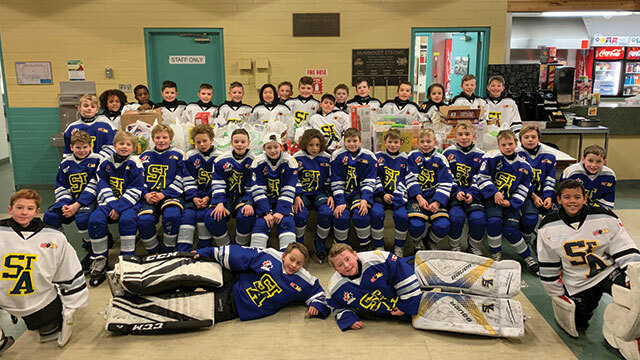 "Fort Saskatchewan Minor Hockey sponsored their 5th annual "Fill the Net" campaign for our local food bank in Fort Saskatchewan. Both the Major Midget AAA Rangers and the Novice 3B Rangers co-lead the event on December 9, 2018. All home teams playing that day were encouraged to participate." "At the end of the day, the teams gathered almost 700 lbs of food to donate! 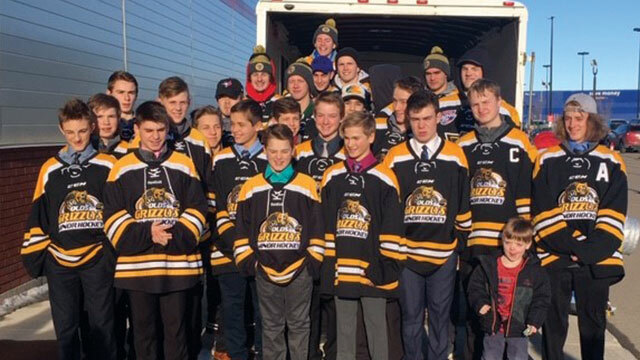 Our local midget players took time out of their Monday (which was a day off from any practice or games) to deliver the donations to the Food Bank." 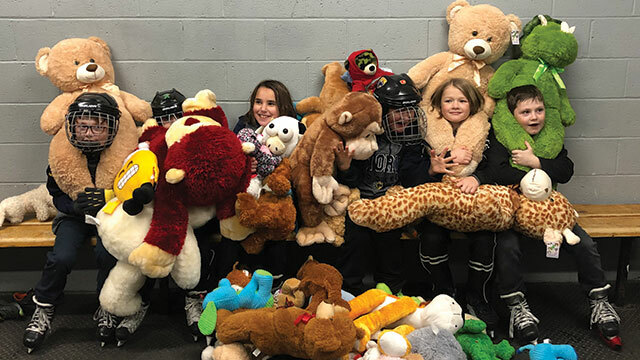 The Lac La Biche Bantam Clippers held their second annual Teddy Bear Toss against Bonnyville on December 15. All teddy bears were donated to the local women’s shelter, Hope Haven, and Victim Services. "The Leduc Roughnecks AtoMc 2 team this year has committed to 10 Random Acts of Kindness within our community." "So far this year they have donated toys to Leduc Santa’s Helper, made up Christmas cards that they left out for people at the Leduc Recreation Complex & participated in the Leduc Roughneck Bantam Female’s Teddy Bear toss where they tossed teddy bears supporting the team’s event & also was able to go onto the ice to help gather and bag the bears with the Bantam Team. It’s been a great experience for the kids so far!" "To show our gratitude for what we have, our Bantam Female team is giving back! They are hoping to make less fortunate kids smile this Christmas! Teddy Bear Toss happened on Friday Dec.7th." "The Teddy Bears tossed were all donated to Santa’s Helpers! The results were amazing...we ended up with 152 bears tossed." 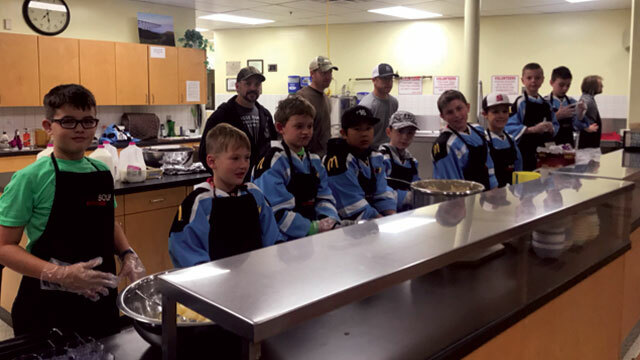 "Team Yeti from the Lethbridge Atom City Division is giving back by helping out at the local soup kitchen. We’ve already done one breakfast and are planning to go back in the new year to help serve breakfast again." "It’s a beautiful thing to hear our boys requesting to go back because they feel like they’re helping people who need it. They made breakfast, served it to the guests and cleaned up afterwards. So proud of our boys!" "Today our Atom B Kings learned a valuable lesson.... not only is coach Jason teaching them hockey skills but more important to be great citizens. These kids gave up two hours of their saturday afternoon to work kettles for the salvation army." "The Atom B Kings would like to challenge the other Atom teams to book a shift and help the salvation army out this holiday season. We had a very proud group of parents as we left the mall this evening." "Our Atom CAHL Hounds Black gave back for Christmas this year. For their Christmas party, they Adopted a family - raising $1400 among team families to make Christmas special for a family in need." 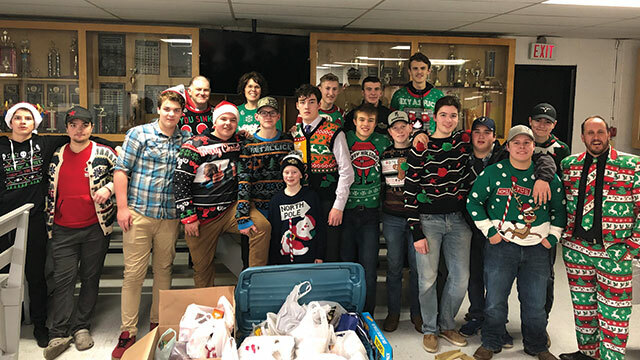 "The boys shopped and wrapped as a team, celebrating the gifts and lessons we have been fortunate to receive through the sport we love, along with the gift of giving back." 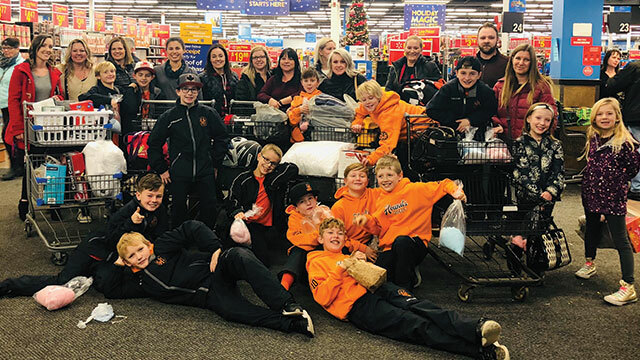 The Olds Bantam AA Grizzlys donated toys and money the the Olds and District Christmas Angels program to give back to the community. "A former Onoway Midget player now for the 3rd year planned and organized our Christmas showdown, collecting food bank donations as well as money and toys for the less fortunate. We were able to collect quite a haul of food and toys to share in our community! And had a fun time wearing our Christmas sweaters too! Thanks to the Edson Sabre’s for getting in the spirit and sharing too!" "It is the Christmas season, and for many, it is a time to give selflessly to others in the community. Over the past two weeks, the SP795 Atom Arrows have been busy preparing a special gift. 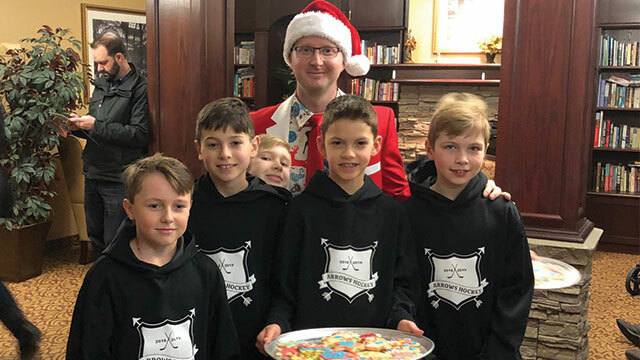 Led by the Arrows Coach and Manager, the boys came together as a team to decorate over 100 Christmas Cookies and to practice singing Christmas Carols, with a plan to deliver their creations to local seniors. On Sunday, the entire team met at the Summerland Retirement Village, and to the delight of the residents they handed out cookies, chatted with the residents and even sang a few Christmas carols. Although the Christmas carols were a little off key, they could see the seniors dancing in their chairs, delighted to hear these boys sing. As a parent group, we feel blessed to have had a child placed on this team, to watch our boys show politeness and kindness to the residents brought tears of joy to many and made hearts sing." "It is in the leadership and guidance of Coach Dave and Manager Erin that the Atom Arrows have been given tremendous opportunity to grow as hockey players and young adults. They have opened up their home on countless occasions and are always looking for new opportunities for the boys to grow. The boys are not only being coached to make great plays in hockey, but through the efforts of Dave and Erin they are learning life lessons, such as selflessness and the importance of giving back to our community, they are also learning what it means to be a “teammate” in a locker room of friends. Thank you, Dave and Erin, for being such a great SPMHA family. We are proud to be the Parents of an Arrow player." "The Spruce Grove Pee Wee AA Timberwolves organized an event at two Spruce Grove vs Spruce Grove games. One of our community hockey players, Hudson Pedlar, was hospitalized with a serious illness due to influenza. He’s has a tough battle for over 6 weeks now in the hospital and will continue to have an extremely long time for therapy and healing. He is 8 years old." "During the Pee Wee AA Game Timberwolves vs Broncos, we held a 50/50 with all profits going to #hudsonstrong. We also added it to the Bantam AA Timberwolves vs Broncos game. We raised over $1,700 and the two winners donated their winnings back to Hudson." "We also held a Kinettes food drive during the Pee Wee game for the food bank and ended up getting over six giant bins full! It was a great day of giving back to the community, we are so proud of the players!" 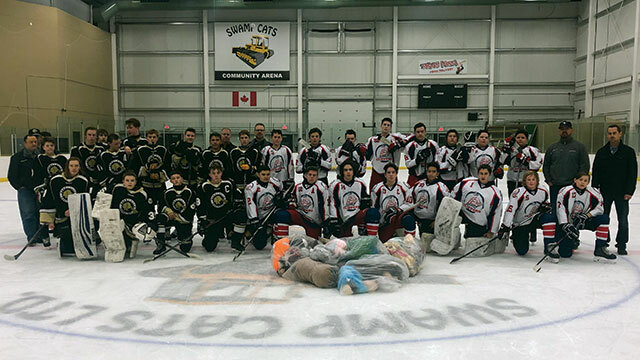 The St. Albert SA731 and SA732 challenged parents and fans to bring donations for the local food bank to their game. RED DEER - With the 2019 Canada Winter Games less than two months away, the Team Alberta U16 Male and U18 Female squads will both get together in Red Deer this week for Christmas Camp. The camp offers the chance at a special sneak-peek at both teams, as each will play a pair of exhibition games against Midget AAA or Bantam AAA teams. The U16 Male squad will face off against the Red Deer Midget AAA Optimist Chiefs on Wednesday, December 19th at 7:30pm, and the St. Albert Midget AAA Raiders on Friday, December 21st at 2:00pm. The U18 Female team will play the Red Deer Bantam AAA Rebels on Thursday, December 20 at 7:00pm, and the Leduc Bantam AAA Oil Kings on Saturday, December 22 at 12:30pm. All games are at the Enmax Centrium in Red Deer, and are open to the public. There is no cost to attend, but all attendees are encouraged to bring a non-perishable food item to donate to the Red Deer Food Bank Society, or a cash donation for the Hockey Alberta Foundation. RED DEER – The deadline is approaching for Peewee coaches across Alberta to enter their team for the Chevrolet Good Deeds Cup, and to register to receive their Team Kit. The Chevrolet Hockey program seeks to inspire young Canadians to be better people by promoting the positive values learned through hockey, and acting on them by performing Good Deeds in their community. The goal is to develop our future hockey players on and off the ice. 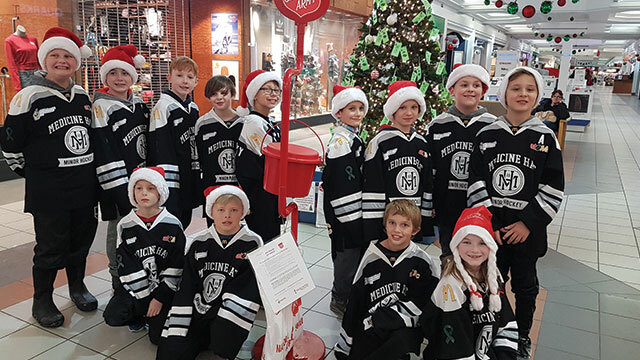 Through the Chevrolet Good Deeds Cup, Chevrolet makes donations to causes on behalf of Peewee Hockey teams across the country. The deadline to enter is January 2. RED DEER – Hockey Alberta is pleased to announce the host sites for the 2019 Hockey Alberta Provincial Championships, presented by ATB Financial. In addition, Hockey Alberta is undertaking a trial Provincial Championship Model. The trial will see the Peewee A-D Provincial Championships transition to Peewee Tiers 1-4. The Peewee Tiers 1-4 Provincial Championship Tournaments will take place March 28-31, with eight teams – the host, a wild card, and the champions from Hockey Calgary, Hockey Edmonton, Central Alberta Hockey League, Northern Alberta Interlock, All Peace Hockey League, and North Eastern Alberta Hockey League. Week one (March 14-17) features 13 tournaments: Bantam A, Bantam B, Bantam C, Bantam D, Bantam Female A, Bantam Female B, Atom AA Major, Atom AA Minor, Atom A, Atom B, Atom C, Atom D, and Atom Female. Another 12 tournaments are set for week two (March 21-24): Minor Midget AAA, Midget A, Midget B, Midget C, Midget D, Midget Female AAA, Midget Female A, Midget Female B, Bantam AA, Bantam Female Elite, Peewee Female A and Peewee Female B. Week three (March 28-31) will see nine more tournaments: Senior AA, Junior C, Midget AA, Midget Female Elite, Peewee AA, and the Peewee Tiers 1-4 events. The 2019 Provincials wrap up with Junior B, the lone tournament running April 4-7. The following provincial champions will be decided via league playoffs: Senior AAA, Junior A, Midget AAA, and Bantam AAA. ATB Financial will once again headline as the presenting sponsor of the Hockey Alberta Provincial Championships, continuing a long-standing relationship with Hockey Alberta. The majority of teams competing in minor Provincial Championship tournaments qualify by winning a zone playdown. Playdowns start in mid-January across the province, with over 700 teams vying for the right to represent their zone at the provincial championships. Host teams receive an automatic berth in the championship they are hosting, although they do participate in zone playdowns, and have the opportunity to win their zone title. Hosts for the following events are still being accepted and reviewed: Midget Female A, Bantam Female A, Bantam Female B and Atom AA Major. Interested applicants can contact Bryden Burrell, Coordinator, Hockey Programs. Hockey Alberta would also like to congratulate the Blackfalds Wranglers, who will host the 2020 Junior B Provincial Championships. RED DEER - Just days after being selected to Team Alberta U18 Female for the 2019 Canada Winter Games, three Albertans were named to the National Women’s Under-18 Team for the 2019 IIHF U18 Women’s World Championship. Forwards Danielle Serdachny and Rachel Weiss, and blueliner Stephanie Markowski will all suit up for Team Canada in Obihiro, Japan, just over a month before stepping on the ice in Red Deer for the Canada Games. All three athletes competed as part of Canada’s National Women’s U18 team in a three-game series against the United States in August, and have all previously played for Team Alberta at the U18 Nationals - Serdachny in 2017, and Markowski and Weiss in both 2016 and 2017. The 2019 IIHF U18 Women’s World Championship runs January 6-13, with the Canada Winter Games running February 15 - March 3 in Red Deer, with the Female Hockey competition set for February 24 - March 2. BONNYVILLE - The World Junior A Challenge returns to Alberta as the 2018 edition of the tournament kicks off in Bonnyville on Sunday. This is the second time in three years Bonnyville has hosted the World Junior A Challenge, as the town was also awarded the tournament in 2016. It’s also just the third Alberta stop in WJAC history. Five Albertans will compete in the tournament for Team Canada West: Dylan Holloway (Bragg Creek), Austin Wong (Cochrane), Luke Bast (Red Deer), T.J. Lloyd (Lloydminster) and Matthew Davis (Calgary). Canada West opens tournament play Sunday at 5pm against the United States. Five Alberta Officials have been chosen to work the World Junior A Challenge: Referees Colin Stefanyk (Red Deer) and Kyle Kowalksi (Edmonton), and Linesmen Jason Nedinis (Calgary), Will Moss (Calgary), and Przemek Iwaniec (Calgary). RED DEER - Hockey Alberta is pleased to announce the Team Alberta roster for the 2019 U16 Male team that will represent the province at the 2019 Canada Winter Games in Red Deer. "The depth of hockey talent in this province is significant, which resulted in many difficult decisions for us," said Head Coach Bobby Fox. "Our staff is excited to work with this group of 20 players moving forward to the Canada Winter Games." Players were selected to the shortlist based on their overall play throughout the Team Alberta scouting process, the Alberta Cup in April, and at the U16 Summer Camp in Camrose in July. Eighty players were invited to Camrose, and from the Summer Camp, a shortlist roster was established and monitored in league play during the first months of the 2018-19 season. Team staff includes: Bobby Fox (head coach), Brandin Cote (associate coach), Jeff Shantz (assistant coach), Alex Mandolidis (video coach), Derek Purfield (goalie coach), Karyn Fanstone (athletic therapist), Dave Campbell (equipment manager), Jamie Porter (head scout), Michael Kraichy (Director of Hockey Operations), Dustin Moore (Assistant Director of Hockey Operations), and Barry Medori (Coach Mentor). Alberta’s Minor Hockey Associations are well-represented amongst the team, with 13 different associations represented on the roster: Airdrie, Alix, Beaumont, Beiseker, Bonnyville, Calgary, Edmonton, Fort Saskatchewan, Lethbridge, Lloydminster, Okotoks, St. Albert, and Whitecourt. Since men’s hockey was first contested at the Canada Winter Games in 1967, Team Alberta owns 10 medals, including gold in 1967, 1975, 1999, and 2003. The U16 Male squad is coming off a silver medal at the most recent games in Prince George in 2015, a team that featured five recent invitees to the 2019 National Junior Team Selection Camp. The Canada Winter Games run February 15 - March 3 in Red Deer, with the Men’s Hockey competition set for February 17-22. The entire Team Alberta U16 Male roster will meet for Christmas Camp in Red Deer on December 19-21. The team will host two exhibition games: Wednesday, December 19 at 7:30pm versus the Red Deer Midget AAA Optimist Chiefs, and Friday, December 21 at 2:00pm against the St. Albert Midget AAA Raiders. Both games are at the Enmax Centrium, and are open to the public. RED DEER - William (Doug) McKenzie, a Life Member of Hockey Alberta, died on Tuesday, December 4 at the age of 94. Doug was involved with amateur hockey for more than seven decades – working at the local, regional, provincial and national levels. His lifelong involvement with hockey began as a minor and junior player with Edmonton’s Canadian Athletic Club. After years of administrative involvement with the Edmonton Minor Hockey Association, Doug became involved with Hockey Alberta as Minor Council North Vice Chair and Vice President. Doug served as President of Hockey Alberta from 1975-80, and Past President for six years. In 1981, Doug became involved at the national level with the Canadian Amateur Hockey Association, serving as a Director and Senior Hockey Chair. Doug was instrumental in building hockey relations with Japan and the Hokkaido Ice Hockey Federation. He first travelled with the University of Alberta Golden Bears to play in the Pacific Rim Tournament. This led to many exchanges with Japan and Hockey Alberta over the years. During his last trip to Japan, Doug presented the "McKenzie Friendship Cup" to the Hokkaido National Team. Among his numerous accolades, Doug received Hockey Alberta’s President’s Award in 1981, was named a Hockey Alberta Life Member in 1992, and was inducted into both the Alberta Hockey Hall of Fame (1989) and the Alberta Sports Hall of Fame (2009). As well, in 1993, the McKenzie Cup, awarded to the Alberta/British Columbia Senior AAA champion, was named in his honour. Doug is lovingly remembered by his wife of 71 years, Peggy; sons George (Gloria), Richard (Marla), Alex (Wendy), and Tom (Karen); grandchildren Kim (Scott), Sheri (Marc), Maria (Mike), Jordie (Jen), Melissa (Mark), Ashley (Myles), and Michelle (Sam); and great-grandchildren Makayla, Jordan, Tristan, Taisyia, Kaleah, Brooklynn. Doug is predeceased by his parents, George and Francis, and sister Anita. A viewing will be held on Tuesday, December 11 from 4-8 pm at Evergreen Funeral Home (16204 Fort Road) in Edmonton. A funeral is scheduled for Mount Zion Lutheran Church (11533-135 Street NW) in Edmonton on Wednesday, December 12 at 2:30 pm. In lieu of flowers, donations may be made to Mt. Zion Lutheran Church or Youth Emergency Shelter Society. EDMONTON – The world’s best junior hockey players will be skating for gold on Alberta ice at the 2021 IIHF World Junior Championship. Hockey Canada, in partnership with the Canadian Hockey League (CHL), has awarded the 45th edition of the international tournament to the cities of Edmonton and Red Deer. Smith was chair of the site-selection committee, which also included Hockey Canada CEO Tom Renney, former Hockey Canada board chair Joe Drago and CHL president David Branch, and was supported by Dean McIntosh, vice-president of events and properties for Hockey Canada as the committee’s resource staff. Hockey Canada has played host to the IIHF World Junior Championship 12 times in the tournament’s 41-year history; the 13th IIHF World Junior Championship on Canadian ice officially kicks off this month in Vancouver and Victoria. Organizers of the 2021 tournament will take part in the 2019 IIHF World Junior Championship as part of the preparation and planning for Edmonton and Red Deer. Leading the committee are Oilers Entertainment Group (OEG) in partnership with the City of Edmonton, and the Red Deer Rebels Hockey Club in partnership with the City of Red Deer. The Government of Alberta has committed its support to the 2021 IIHF World Junior Championship. The 2021 World Juniors will be co-hosted at Rogers Place, the home of the NHL’s Edmonton Oilers and Oil Kings of the Western Hockey League (WHL), and at the ENMAX Centrium, home of the WHL’s Red Deer Rebels with regional economic impact expected to exceed $50-million. "World Juniors is more than a hockey tournament. It is our national tradition. Red Deer is honoured to be a partner host City for the 2020/2021 World Juniors, especially given our strong community history of hosting Juniors in 1995", said Red Deer Mayor Tara Veer. "We will build on this proud heritage with our government and hockey partners. Hockey Canada, the Oilers Entertainment Group and the Red Deer Rebels are to be applauded for the hockey and Canadian history we are writing today, and for the opportunity they have secured for us". Tickets for the 2021 IIHF World Junior Championship will be available to Edmonton Oilers, Oil Kings and Rebels season-seat holders in the spring. Tickets will go on sale to the public at a later date. A legacy plan for potential profits from the event will provide for grassroots hockey program support across the province and throughout Hockey Canada’s 13 regional members, as well as the CHL. A portion of the profits are used by the IIHF to grow the game internationally. RED DEER - Hockey Alberta is pleased to announce the Team Alberta roster for the 2019 U18 Female team that will represent the province at the 2019 Canada Winter Games in Red Deer. "Our staff is really excited about this team," said Head Coach Carla MacLeod. "It has been a process to get to this point and all the girls involved have been a pleasure to work with. The 20 girls selected are all individually skilled and driven and we are looking forward to the next step of becoming an Alberta Built team. To play at the Canada Winter Games in Alberta is an honour that we cannot wait to experience." Team Alberta is coming off a bronze medal finish in women’s hockey at the 2015 Canada Winter Games in Prince George, BC, a feat also accomplished by the 1999 team in Corner Brook, Newfoundland. Team Alberta is a two-time gold medalist at the Canada Winter Games, most recently in 2011 in Halifax, Nova Scotia, and the inaugural gold medal in 1991 in Charlottetown, P.E.I., the first year women’s hockey was incorporated into the Games. The Team Alberta selection process began at the Team Alberta U18 Spring Camp in May, followed by Summer Camp in July and Fall Camp in September. The Canada Winter Games run February 15 - March 3 in Red Deer, with the Female Hockey competition set for February 24 - March 2. The roster for Team Alberta U16 Male will be announce at 4:00 p.m. on Thursday, December 6. CALGARY - Six Albertans are among the 34 players invited to Hockey Canada’s National Junior Team Sport Chek Selection Camp for the 2019 IIHF World Junior Championship. Goaltender Ian Scott, defencemen Jacob Bernard-Docker, Ian Mitchell and Ty Smith, and forwards Jaret-Anderson Dolan and Brett Leason will all vie for a spot on Team Canada. All six players are Team Alberta alumni. Scott, Mitchell, Smith, Anderson-Dolan and Leason all played for Team Alberta U16 Male at the 2015 Canada Winter Games. Smith also represented Alberta at the 2015 WHL Cup, along with Smith, winning gold. Calgary native Tim Hunter will serve as the Head Coach of Team Canada, joined by fellow Calgarian Brent Kisio, who was selected as an Assistant Coach. The National Junior Team Sport Chek Selection Camp runs December 11-14 in Victoria. The World Junior Championship is set for December 26 - January 5 in Vancouver and Victoria. RED DEER - Hockey Alberta’s November Coach of the Month, sponsored by Players Bench Team Apparel, is Danielle Wheeler of Stettler. A former Canadian Women’s Hockey League player, Danielle has been coaching since 2009, and currently coaches both the Stettler Novice Green and Stettler Novice Mites Grey teams. She also serves as the Registrar for Stettler Minor Hockey. In addition to hockey, Danielle coaches baseball, soccer and lacrosse. "I love passing my love of sports and activity onto the kids," she said. "Seeing them excel and improve is amazing especially with how far they come from the beginning of the year to the end at the younger ages." "Danielle supports each player and encourages them beyond any parent expectation,’ said the parent who nominated Danielle. "Her guidance and skill is remarkable, quite likely the best coach my child will ever be lucky enough to work with." Hockey Alberta is proud to recognize Danielle for her effort and accomplishments ahead of Female Hockey Day. Hockey Alberta is celebrating all aspects of female hockey on Saturday, December 15 in Red Deer with a day full of on and off-ice activities for players, coaches, officials, and parents of all levels. December 17, 2018 Inaugural Female Hockey Day showcases "Why We Play"